Sooner or later it happens. 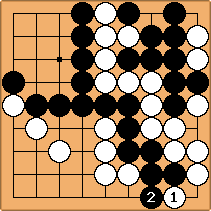 In the following position White resigned, in the actual game. But she could resist. Consider this as a problem. I will post a solution in several days. After White 1 and Black 2, Black cannot win the ko because White has an infinite number of ko threats in the right top corner. It's a triple ko, a very unfortunate thing. Yesterday, I backed up letting somebody pass and stepped on a toe of a girl behind me. It did hurt. Stefan: My god! The curse continues...! HolIgor: The komi was 5.5. My opponent resigned though. Either he did not see this or was trying to avoid invoking the curse. Doesn't the outcome of the game depend on the ruleset being used? Suppose the "superko" rule is in effect? Then what happens? What happens next with superko rule? HolIgor: I am not a rule expert. So I posted this question on the rgg newsgroup and the pundits agreed that Black won. You may find the discussion in the rec.games.go archives. Charles Matthews If you want to apply the superko rule at all, you have to know the whole game history, don't you? The 'state' of the game isn't summarised by the state of the board. Bill: We can apply it to this triple ko by taking this position as the root. In that case it acts like a simple ko, in that the player who takes first can force the other player to tenuki first.